Edith Piaf was born December 19, 1915 in Paris during the First World War. His father was an artist of circus contortionist and antipodiste born in Castillon in France. His mother was a street singer, born in Livorno, Italy. First, she was raised by her maternal grandmother who left without care and then by his paternal grandmother, madam of a brothel in Normandy. According to legend, between three and six years old, she suffered blindness in both eyes. Accompanied his grandmother, Edith and all its residents went on pilgrimage to the tomb of St. Therese of Lisieux to ask for his healing. Eight days later she received his sight. In gratitude, Edith kept a medal of St. Therese around his neck throughout his life. At six years old his father fetched to bring her at a circus like him. At fourteen, she leaved his father to become a street singer like her mother. At sixteen, she met her first love, Louis a deliveryman and settled in Montmartre in Paris (in the period Mercury-Jupiter). At seventeen, Edith Piaf gave birth to her daughter Marcelle, 11 February 1933. At sixteen years old, she met her first love Louis, in the period Mercury-Jupiter. Jupiter is conjunct with House V, that of love. Marcelle was born February 11, 1933. That is positioned at 11° 14′ of Libra in House XI. This degree has a Powerful force. It is a degree assigns to its two governors Venus and Saturn. The degree of the year is set to 18° 08′ of Leo. It is conjunct with Mars of Very Powerful force at the Midheaven. At seventeen years and three months, he announces the Mercury-Saturn period. Saturn has a Middle force in House VIII. The degree of year becomes of Very Powerful force by its conjunction with Mars which culminating at Midheaven. Mars is the Governor of the House V, that also of children (4° 28′ of Aries). The degree of the day is in Libra in House XI in front of the House V, that of children. 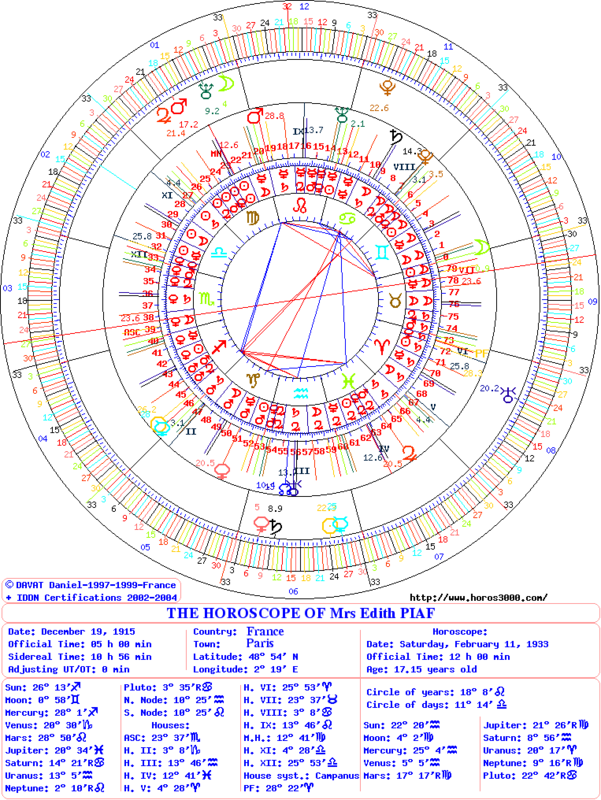 On February 11, 1933 is set at 11 ° of Libra in natal House XI and in House IX of SR. The degree of the year is at 17° 28′ of Leo in natal House IX and conjunct with House VIII of SR, with Moon of SR and Part of Fortune of SR. The planetary period is always that of Mercury-Saturn. 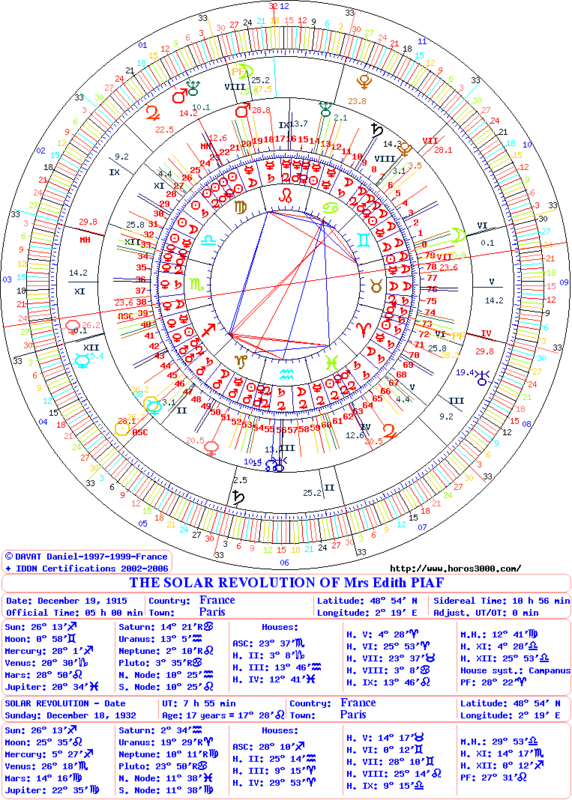 At the degree of the year, the conjunction of natal Mars with the Moon of SR are determinants of birth because natal Mars is Governor of natal House V, that of children and the Moon of SR (in nocturnal birth) is governor of the House V of SR located at 14° 17′ of Taurus. Part of Fortune announces that the birth went well. This entry was posted on Saturday, March 29th, 2014 at 9:36 amand is filed under Edith Piaf, Love. Both comments and pings are currently closed. TҺis is a topic which is close to my heart… Chеers! Whеre are your contact details though? tɦe site is also reallƴ good. to change, may you be ricdh and continue to guide others.